Everyone looks at reviews. Whether we’re trying to find a new restaurant or we’re looking for a contractor for a major project, most of us don’t go out on a limb without doing some due diligence. So what is your business doing to (1) make sure your happy customers are leaving good reviews and (2) manage sub-par reviews online? When was the last time you googled your own business to see what people are saying? If you’re not managing your online presence, you’re missing an opportunity. There are dozens of review sites out there and many of them come up when you search for businesses, so you’ll want to decide which sites are most important for your type of business. Reviews on your own website, on Google and on Facebook are important to start. If you’re in the restaurant or entertainment business, perhaps add Yelp, OpenTable or Foursquare. In a trade? Think about going after Angie’s List, Home Advisor and the BBB’s website. Focusing on a product? Look into Epinions and, if you sell on Amazon, then the feedback section of Amazon. Customers will review your business in whatever space they like best, but sending them in the right direction is the first step on your end. Asking for a review is a little like asking for a referral, except easier. You’re not asking them to stand up for you or put their name on the line with a friend or family member. You’re just asking them to tell the world about the positive experience they had with your business, often even under an online pseudonym. 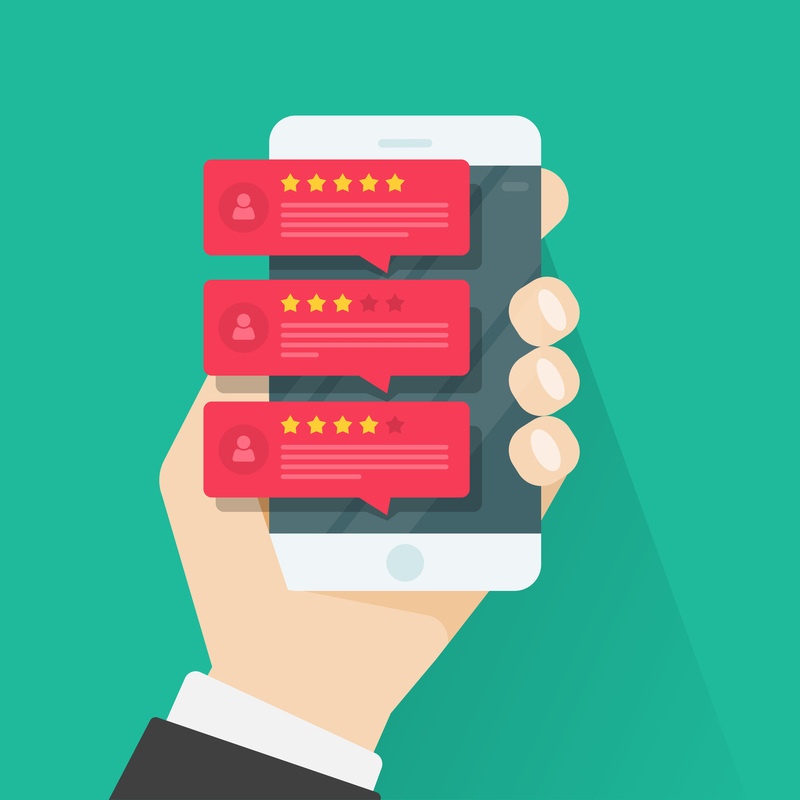 You can ask for reviews in a multitude of ways, but before you ask them to review, encourage that you and your business would appreciate a five-star review and ask if there’s anything you can do to ensure that they have a five-star experience. Often the difference between a four-star review and a five-star review is something pretty small. You can ask customers to leave reviews when you’re working with them in person, through a note card on the counter or with their bill, but some of the most effective review asks come via email or social media. You want your reviews to be online and, by asking people while they’re already online, you’ve already won half the battle. If someone does leave you a physical note or calls with a compliment, it’s worth asking if they are willing to leave a review online OR if you can put their review on your website, where you can control which reviews are posted and what’s said. Just be sure to ask for permission! Of course, when you ask customers for reviews, you have to be ready for less than stellar comments. Some people are just tough customers and a normal-quality experience will come in at three-stars, but you have to be prepared to mitigate negative comments and complaints online. This does require some effort, but it’s worth it. If someone leaves you a terrible review, but people see that you’ve replied with a polite explanation, apology or way to make it right, they see that you’re focused on customer service. Negative reviews that are left unattended – or even worse, replied to in an angry or snarky way – are negative all around. Many review sites will notify you when you’ve received a review, but you may want to check on the review sites you’ve chosen to focus on a couple of times a month. Also, if you have a connection with someone who left a great review, this is a perfect time to thank them and maybe request a referral! This entry was posted in Business Coaching and tagged business, business blog, business coach, business coaching advice, business complexity, business development, business management, business owner, business owner mindset, business reviews, business systems, entrepreneur, management, marketing, rating, referrals, review, reviews, small business, small business leader, small business management, strategic business owner, strategic mindset, strategic thinking, success. Bookmark the permalink. Great points! I’m still seeing some small business owners today who don’t manage their business’ online presence… not knowing that their business is already hoarding negative reviews online.